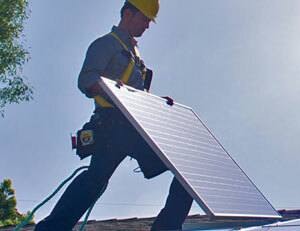 Adding solar panels to your home is simple with JSKYE’s factory trained, state-licensed installers. 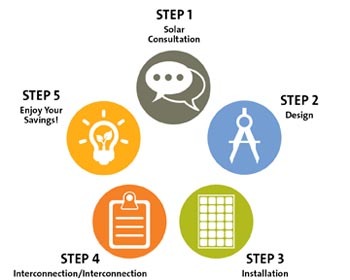 Get added peace of mind, knowing that JSKYE, with over 10 years of experience, has custom-designed your solar electric system to get the most out of your roof. Step 5: Start enjoying immediate savings! All home solar systems from JSKYE are custom-designed by our engineers to meet your family’s energy usage and professionally installed by our factory-trained, state-licensed installers. Rooftop solar systems are the most popular option for home owners because residential roofs usually have enough space and are well-suited for maximum energy production. Your roof should be unshade and ideally facing toward SSE and SSW for best results. A JSKYE installer can access your home’s suitability for solar and provide you with a report detailing your projected savings with solar. A ground mount solar system is ideal if you need a larger system than your roof will accomodate and have the available space on your property. JSKYE solar panels are engineered to deliver peak power production for at least 25 years—which means our installations need to be designed to last. Our factory-trained installation partners must meet our exacting standards, and are routinely audited to ensure worry-free, damage-free installations. Professional business practices, background checks and consistent, positive customer reviews are all “must-haves” for JSKYE installers. JSKYE technologies are different because we are different. Our commitment to quality powers our success, and is why our solar panels consistently produce clean energy for at least 25 years—even in the harshest weather conditions. Your solar investment is only as good as a solar system’s ability to produce energy. Call us control freaks, but we make achieving maximum energy output through an obsessive attention to detail our top priority. Every JSKYE solar panel undergoes stringent quality checks throughout the manufacturing process. We flash-test then plus-sort, which is a fancy way of saying we do everything we can to deliver more power to you. We have been ISO 9001 certified for more than 10 years, have never had a product recalled and guarantee the performance of our solar panels for at least 25 years. All solar panels are not created equal. While many solar technologies are made cheaply overseas, JSKYE Solar panels are made in Indonesia, by Indonesia, for Indonesia. We control every aspect of the manufacturing process to ensure long-term energy production. Maximize your return on investment with worry-free performance. We eliminate the decrease in power that can come from shading caused by mounting components and dirt accumulation. We test and retest our solar panels for performance in the real world, not artificial laboratory conditions. Our panels perform consistently over decades; others deliver short-term performance that diminishes system value over time. With a proven track record that spans more than three decades, we’ll be here to honor warranties and service commitments for years to come. Backed by proven, Indonesia-made quality, reliability and durability, JSKYE continues to be the trusted solar provider for homes throughout the Indonesia and around the world. Our plus sorting and solar panel design ensure you get all the energy you pay for. Only solar panels achieving or exceeding the designated nominal power in performance tests are available to customers. The power tolerance ranges between ±5%. That equals more savings and greater ROI from your solar system. Because JSKYE produces the highest quality, we can guarantee the best performance. That’s why JSKYE offers a 25-year linear performance guarantee on the JSKYE Solar panels series and an industry-leading 25-year warranty on the JSKYE Solar. A 10-year product workmanship warranty is also standard with every solar panel we sell.